I've shown bits and pieces of my second Orange Peel quilt on here and on Instagram, and I'm happy to say that I've finished the top AND the backing! It's basted, too - yay! This quilt is an inverse of Scatter, to give my students more options with their fabric choices. I'll talk more about the fabric placement (planned improvisation) when it's all done. We have four days of spring break coming up, including the weekend, so I'm hoping to fit in lots of sewing! Plus, I'm making this quilt my April ALYOF goal. Happy April! Oh it looks fabulous, Jess! I especially love the fussy cut orange peel that says "April"! I hope the doctor's appointment goes well, and so sorry about your voice. I absolutely love how this top came out. I can't wait to see what you do with the quilting. I'll also be looking forward to your tutorial/explanation on your planned improv piecing. Creative, fun & bright~well done! I really like the colors and the orange peels. This is awesome. Still sick! Ugh! I think you made the right choice putting all of the orange peels on solids, I think a print background would have made their shape less crisp and clear. Look forward to seeing how you quilt it! My best best is on some swirls...somewhere. This is so cute! I hope you feel better soon! I love this quilt and the first one, too! Very cool pattern. Looks like purple rules in your stash! Just kidding. Looking good! This is absolutely fabulous! I can't decide which I love better - the original or this one! I do so like your improv quilts, my OCD currently demands a bit more order but I'm trying to stretch my horizons! That looks fabulous! Love the rainbow look to it. This is lovely! I really like how the curves of the orange peel segments play against the linear improv piecing. 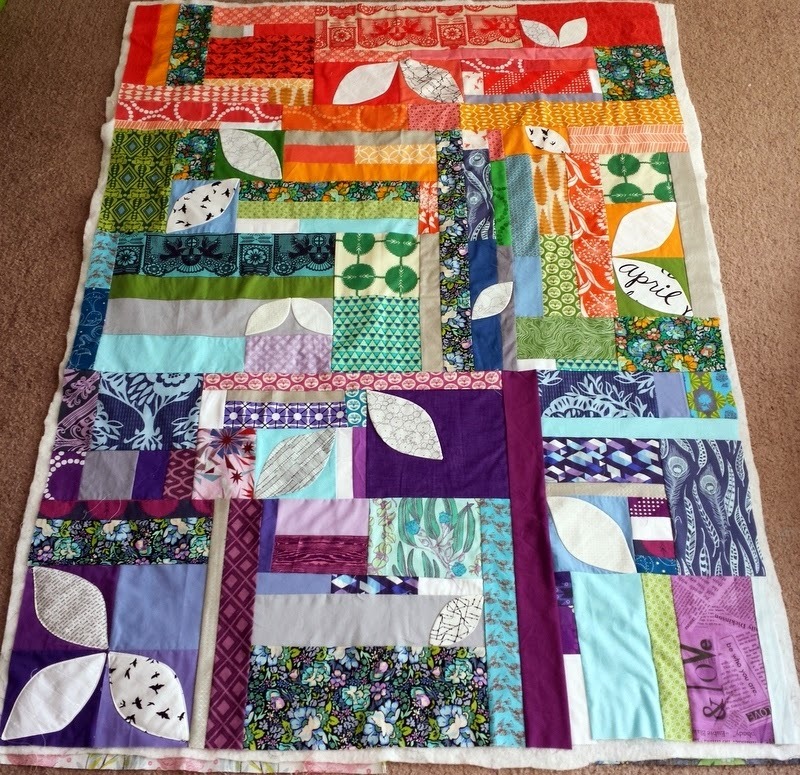 Such a cheerful, energetic quilt -- hope it's energy perks you up soon, too!! Really love this quilt. What fun colors! Love the randomness of it all. Love! The color and fabric combo is so pretty. It's beautiful - I love the colours and the leaves just pull it all together! Beautiful! Since we are all enjoying the newly harvested citrus from the trees here in California, I love the orange peel motifs scattered throughout your quilt, through a field of colors. Wonderful! I just love this quilt!! Good luck with your goal.